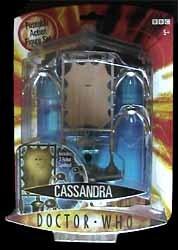 The Cassandra action figure from Character Options is certainly the most unusual release to date. 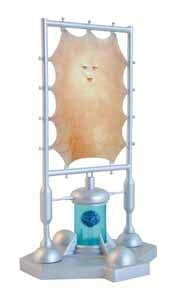 It depicts Lady Cassandra from the second episode of the new series The End of the World, supposedly the last 'human' in existence, although having gone overboard with the nips and tucks, she now resembles a piece of flat skin stretched onto a frame with just the eyes and mouth remaining as a reminder that she was once human. Although released as a 'poseable action figure', there is nothing particularly poseable about this flat piece of skin on a frame, though it does move along nicely on wheels if that counts. However, articulation was never really going to be Cassandra's selling point, it's the weird and slightly disturbing look of the character that ranks high in importance here, and I'm pleased to say that this figure looks fabulous. Every feature in the figure is beautifully detailed, from the subtle veins in Cassandra's skin to the brain in a jar at the bottom of the frame. It's certainly going to one of the strangest things you put on your mantelpiece this year. As if that wasn't enough, you also get three of The End of the World's robot spiders included in the pack. They're pretty small and not tremendously exciting, but they do add even more quirkiness to this brilliantly odd set. All in all, yet another quality package from Character Options which bodes well for the slew of new Doctor Who releases they have planned for 2006.